I am thankful for the oatmeal which I have been having for the last couple of days. Oatmeal with milk, cinnamon and berries in the morning. Savoury oatmeal for lunch, for example with onions, tomatoes, mange tout and carrots. And for dinner, either vegetable soup like a minestrone or savoury oatmeal with chicken. This “oatmeal diet” has helped me reduced my blood sugar values, therefore, I also reduce the amount of insulin injection, and hopefully will help me lose weight. There’s always hope! I am grateful for the lovely weather last Saturday, conducive to our cycling trip to one of our favourite beer gardens, the Waldwirthschaft. It was an hour cycling from our house to the beer garden, passing through the Perlacher Forest and the river Isar. We had beer and grilled fish and pretzel. There was a jazz band playing some lovely tunes. Such a lovely Saturday. 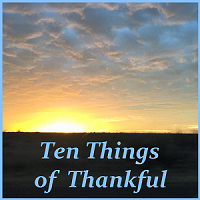 What other things am I grateful about? So, what made you smile this week? Lovely post, LadyLee. I hope your brother recovers quickly. I am glad that your new oatmeal diet is helping to reduce your need for insulin, your body will surely thank you! My daughter has been an insulin dependent diabetic since she was 12, she is also a Registered Nurse. She began a diet this year which has greatly reduced her need for insulin, and has resulted in weight loss and her feeling much better overall. I am grateful for that! I also really like oatmeal and yours looks delicious! I am happy to hear that your husband is free from gout and that your mother is doing well. We worry about older parents, just as one day our children will worry about us. I am also glad that your brother will be getting surgery needed for his shoulder. Those injuries can be so painful and limit how much we can do. I love that you refer to your son as HRH and that you obviously approve of his choice of wife, that is such a relief to a mother! Reading your list makes me smile! The oatmeal diet sounds delicious, i do hope it helps your health and also that your brother recovers very quickly from his surgery. glad it makes you smile, Mimi 🙂 thanks! Wonderful things to be thankful for. I am glad your oatmeal diet is helping to lower your blood sugar. Have a nice weekend! Ah, Germany. I have family there and visited when I was a teenager. Love the beer gardens, but didn’t get to truly experience many when I was there. I enjoyed your post so much, and I love oatmeal. I was just planning on having some for breakfast in the morning. But I’ve never tried savory oatmeal. I may try that. Do you make it with any particular seasoning to make it savory, or do you just avoid any sweeteners? thank you, Sandra 🙂 I don’t use any sweeteners. I put a dash of soy sauce and lemon, or salt and pepper. You always have AWESOME photos!!! I laughed when you said you were thankful for oatmeal because I said the same exact thing this morning to my mother… what are the chances that that many people are really grateful enough for oatmeal that they would say it out loud? thank you, Zoe 🙂 yay for oatmeal! cheers! such beautiful images- all made me smile! Your post makes me want to start eating oatmeal again. I’ve never tried savory oatmeal, but it sounds good. What a beautiful path for a bike ride! It sounds like you had a lovely Saturday. That is the largest pretzel I have ever seen. It looks like it is meant to be shared. I hope your brother’s shoulder surgery goes well and he has a speedy recovery. Pingback: The TGIM Weekly Challenge – taste & see!